Satanism is on the rise, and that’s okay! 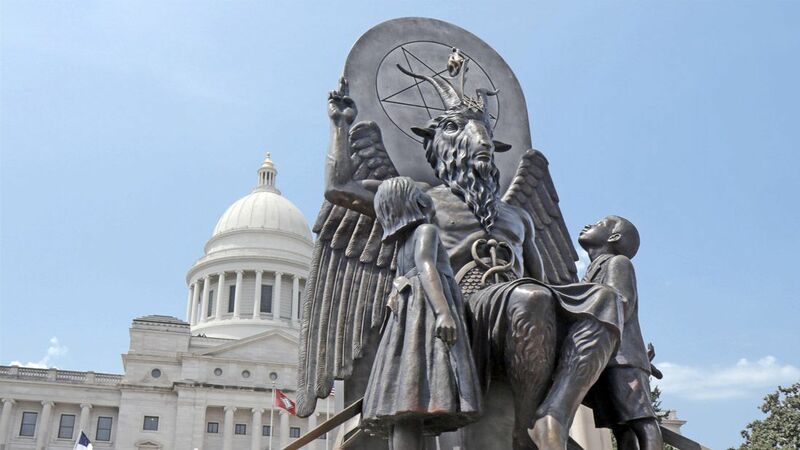 As explained by Penny Lane’s new documentary Hail Satan?, modern-day satanists aren’t worshipers of evil but rather civic-minded citizens who want to uphold America’s religious pluralism by trolling evangelical figures who want to push Christian nationalism. Unfortunately, that seems to be all there is to The Satanic Temple and its followers, so while they seem like a nice bunch of folks with a worthwhile mission, they’re not interesting enough to sustain a feature-length documentary. Rather than dive into what makes a religion or how followers reconcile their inflammatory name with their mild tenets, Hail Satan? becomes painfully redundant as the Satanists try to define themselves while continuing to troll evangelical lawmakers. Although the concept of Satan is millennia old and there have been different versions of “Satanism” throughout history, Hail Satan? focuses primarily on The Satanic Temple (TST) and its most visible co-founder, Lucien Greaves (the other co-founders choose to remain anonymous for reasons that aren’t explained, but presumably to avoid harassment). For TST, Satanism isn’t the worship of evil, but worship of the adversarial (Satan’s name can mean “The Adversary”), specifically with regards to establishment powers that seek to deny the freedom of others. For Greaves, the mission of TST is to promote religious pluralism and fight back when any government entity tries to establish one religion over others like putting The Ten Commandments in front of a state house. From there, Lane depicts TST followers as generally open-minded people who like the freedom and community Satanism provides while also going through why “Satanism” is so controversial is the U.S.
Once you get past that Satanism in its current form has nothing to do with worshiping evil and it’s just a group of people who are advocating for religious freedom, Hail Satan? becomes far less engaging. The film is ostensibly about the rise of a new religion, but Lane doesn’t bother to establish what qualifies as a religion or what religion means to people. As they’re depicted in Hail Satan?, Satanists don’t look like a religion but a political action group. And there’s nothing wrong with their political goals, but religion raises tough questions about faith, morality, and our place in the universe. No one in TST seems to believe that the figure of Satan is real or requires them to wrestle with theology. As seen in Hail Satan?, they mostly come off like atheists who like the aesthetics of Satanism, and “Atheists with better merch” just isn’t all that compelling. The other problem is that the Satanists seem slightly disingenuous in their media strategy. On the one hand, they want people to know that they’re not worshiping evil and that they’re non-violent. But at the same time, their entire media strategy rests on being misunderstood. So many of the news clips Lane uses are from Fox News, who knows that their old, Christian viewers will freak out about Satanists and TST depends on that reaction for recognition. If they were simply The Church of Religious Pluralism, no one would care. As Greaves smirks his way through media appearances, you can tell that for him, this is a way to provoke and offend evangelical figures. But that’s not a religion; it’s a rhetorical device and it quickly wears thin. What’s frustrating is that Lane is continually bumping across more interesting ideas and never really pursues them. Christian Nationalism is on the rise, and that’s far more captivating and dangerous than anything the Satanists are doing. Once you see that the Satanists are pretty normal folks who are advocating for religious freedom, there’s not much else to do, and while Lane does provide some background on America’s history with religion and how Christian Americans have misunderstood the integration of Christianity into government, that’s still not enough to sustain Hail Satan? When Hail Satan? begins in Florida in 2013 with Greaves and his cohorts shouting “Hail Satan! Hail [Florida Governor] Rick Scott!” it’s funny and a clever stab at folks like Scott who want to establish their Christianity in government. But once you see that’s really the only trick in TST’s bag, you wonder where else the documentary can go, and it ends up going in circles. The film touches on TST’s charitable work and divisions between different chapters, but that’s not enough to make the documentary compelling. Maybe in about 10 years there will be a more interesting story to tell about The Satanic Temple, but in Hail Satan?, they seem defined by little more than a willingness to troll evangelicals and the media. There’s nothing wrong with that goal, but it’s not enough for a 95-minute movie. Hail Satan does not currently have a release date. Counting On Fans Called Jessa Duggar And Ben Seewald’s Baby News Months Ago!